@SanghaRen wrote: Sorry, it's not a spoiler, but it made me laugh. I just love Pablo's answer. I must say, I never stopped to think about it. I don't think she's shown any interest in men or women so far. Funny that the poster believes that PH not answering means it's confirmed. Maybe she can be whatever because it's just not important to the story? I agree with you about this....maybe she is so occupied with her family troubles, her Mandalorian heritage and the revolution....that romance is just not a priority for her. I think this question arose because YouTuber Urban Acolyte made a video where he felt Sabine could be a lesbian...not based on anything per se....just what he would like to see happen. Maybe it is the EU fan in me...but I want Sabine to become a canon version of Shae Vizsla, the Mandalorian bounty hunter who reluctantly becomes Mandalore the Avenger to unite her people (though Shae Vizsla lived in the Old Republic era and fought against the Eternal Empire). And while I prefer Kanan-Hera to be the only romance in rebels, I recently developed a mild interest in a Sabine-Ezra romance.....partly because he obviously has feelings for her so it would be sad if they remained totally unrequited....but also because we don't see Mandos in the OT rebel faction I wonder whether Ezra might have to choose between being a jedi and a Mandalorian...which means he might leave the rebellion and hence survive the OT after all and not cause a continuity error. Doea anyone else think the darksaber could be a canon version of the forcesaber from Dawn of the Jedi? The forcesaber was an ancient rakatan weapon which channeled the dark side of the force and its owner became susceptible to the dark side with every use of the weapon. This weapon caused a schism in the jedaai order in legends. Pre Vizsla seemed to be a not so nice character....maybe Sabine will also become a darker character as she uses the darksaber. Absolutely. That's the first thought that came to my mind. I am kidding. Average SW Fan here I have no idea what rakatan means or who pre Vizsla is. Hello Wookieepedia. I am honestly quite sure none of the Star Wars Rebels main characters are going to become really dark. Even if Sabine flirts with darkness, she will not become dark. I just do not think that this is the goal of the series. If you look at the dynamic of the series, nearly all episodes - except the ones working in pair - end up with a lesson to learn for one or more character(s). Last episode too. This is not the format of a series that is meant to grow darker. I think it will keep this family-friendly tone - I don't know how else to describe it - until the end. If they follow TCW, which was also an animated TV show seen by kids, they can get pretty dark....for instance, when Maul decapitates Pre Vizsla with the darksaber, we see his head roll away... Also, Dave Filoni has said that not everyone will survive the series....so they definitely can go down a dark path. But even if they decide to be family friendly, the darksaber can always be explored in movies or a novel....RO already hinted an imperial project with a name hinting the darksaber...I think it is dark sword....don't remember. I think they can go dark, definitively. I just don't think any main character will go the whole Anakin/Vader way. Unless they go with the fact that their audience has grown and decide to focus on them. But then they might have to change the parental guidance. In Germany it's 6 for Rebels, 12 for TCW. I don't think they need to make the main characters go all dark etc., especially with the emphasis on exploring the middle ground in the force like the Bendu......but I also see a certain amount of darkness seeping in where Sabine might have to choose between loyalty to Mandalore and to the rebellion.....or maybe something happens to her brother (the rebels have a tendency to abandon their own in times of crisis- the RO team being a big example) and she leaves the rebellion....and Ezra might end up joining her, whether because of his feelings or because he sees flaws in the rebellion as well. 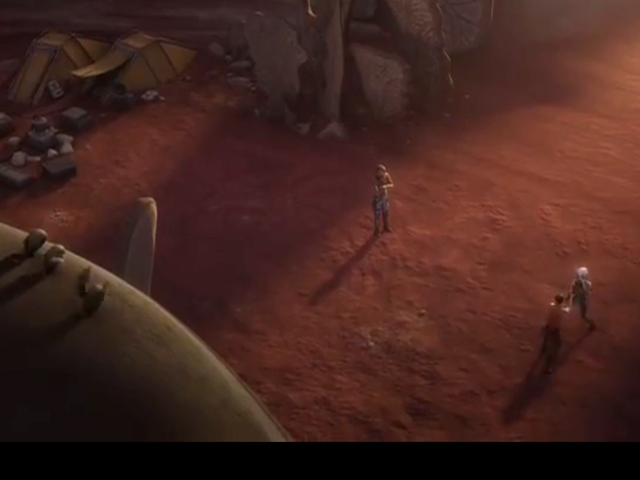 We need explanations to deal with plot holes as to why there are no Mandos in the rebellion, why Luke would be the last jedi when Kanan and Ezra existed just a few years before, why Kanan, Sabine and Ezra seem to be a forgotten chapter of the rebellion (Hera and Chopper appear in RO)....I am hoping it is not because they die....maybe that is why I am looking for an explanation....and the darksaber being a channel for the dark side means they leave the jedi way behind (it doesn't necessarily mean they turn evil). But speaking of dark.....a few episodes back, they showed Murad Sumar getting blown up when Thrawn makes him operate a speeder he sabotaged and they showed bits of wreckage and his burnt up broken helmet landing on the ground, implying he was in bits and pieces all over the room....we even see the scorch marks in places (we've seen decapitations in previous seasons, Kanan's graphic blinding and the seventh sister get brutally killed by Maul).....I think they do make the show go really dark occasionally....but when they do, it is normally for the sake of a good story and not for shock value. I guess I don't see it dark because it still ends well. At 6 you start watching also stuff that includes death, pain and sadness. It's part of the learning process. I think US is 7 for Rebels. I guess the difference is whether it's one scene or the whole episode that is gloomy. However it's quite a jump between age 6 and 12 or 7 and 13 in the US. As I said they might darken it, but will also get rewarded with a stricter PG. I read somewhere that TCW also started with a lower PG and then it was put higher because the tone became darker. 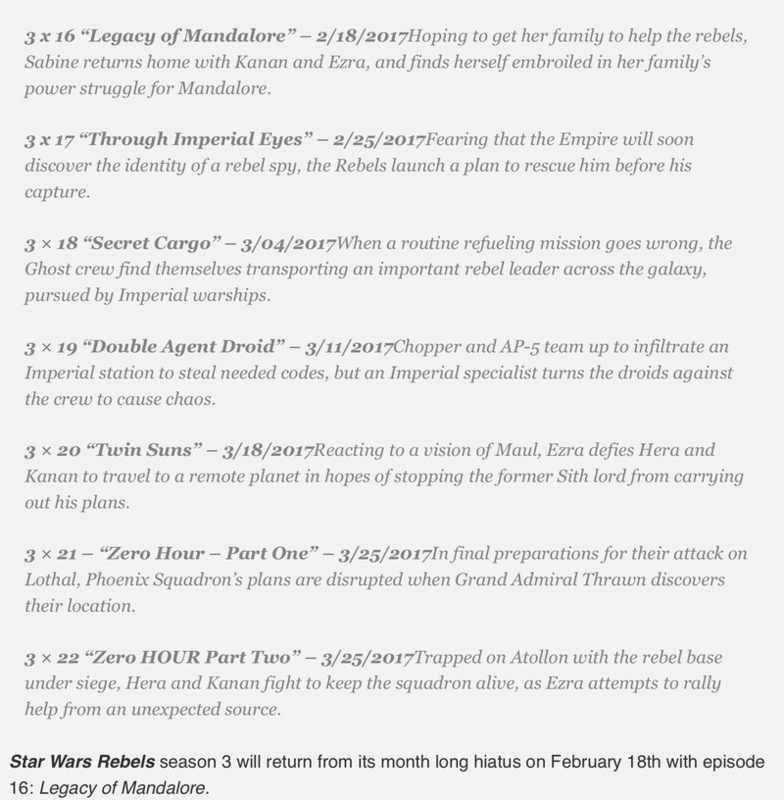 It's true that Season 1 of Rebels seemed lighter and seasons 2 and 3 seem darker. I actually wonder if the PG can be changed in the course of a season. Would be interesting to ask Filoni about whether the show will go darker to adapt to their audience growing up. I think PH once said TCW did not appeal to its audience anymore because said audience had grown out of watching such animated series. Sorry, working in Marketing for some years now, I am curious about the demographics they target. Can't help it. Actually your analysis of target demographic makes a lot of sense....I think maybe I am interpreting dark differently...but you're right about them always ending episodes on an optimistic note.....when I mean dark episodes, I was talking about isolated incidents that they throw in which make me wonder if I am watching a kid's show....but of course, they don't happen in every episode. My thinking is that if Kanan and Ezra incorporate a bit of the dark side of the force (which doesn't mean something that has to end tragically), they wouldn't be jedi any longer...so they don't need to be killed off for continuity sake.... I also want to see more of how the rebellion weren't always the good guys ....or even if they were the good guys, they had bad elements in it....I don't think the rebellion was one unified cohesive group and am sure a lot of factions got disillusioned and left.....just one look at a couple of those cabinet ministers in RO should tell us that some of them were quite mean....so I feel a great way to explain people not being around is because they got sick of how things were run and left....or maybe they even turned a bit dark because of it (in the case of Sabine, Kanan and Ezra). I am also sure Disney/LF will sort out the continuity eventually..... but where is the fun in waiting for the answer without speculating how it will be done? It's a good point about the Rebellion. We haven't seen much division yet except for Saw but that was one episode and it was, I guess, a bonus. It'd be interesting to see someone creating trouble in the Rebellion to mirror Kallus being the Fulcrum. Other topic: were that convorees watching over Sabine's training? To the left of the screen. One comes flying in at the beginning of the scene. If there are convorees, does it make sense there are 3 of them if we go with convor = Ahsoka? I guess there could be normal ones and special ones. Or it's a gathering of non Jedi force user spirits. I'm not sure how it works in canon but in the EU the Nightsisters believe in a parallel spirit world with departed souls becoming plant and animal spirits depending on their totem animal (and they are powerful in that form)...this is the closest parallel I can find to the convorees (in Rebels and TCW) and fireflies that guided Yoda with Qui Gon's voice (in TCW)......the convorees in the Sabine episode dont have the orange and white colour of the convor thought to be Ahsoka.....so you could be right- they might be the souls of other departed force users.....my theory is that they might be the souls of the three jedi padawans who were killed in the "Padawan Lost' episode of TCW as they were hiding with Ahsoka and convorees were first introduced in that episode. Maybe it will never be explained what or who the convorees are in that scene. Maybe it's just to tease the fans and lead them to speculate I just thought it was strange to see one of them fly in like that because your eyes are obviously following it as it joins the two others. A way to say "look, convorees!". I mean, I noticed them and I usually miss such things. Look at my 2 new companions. This is it. 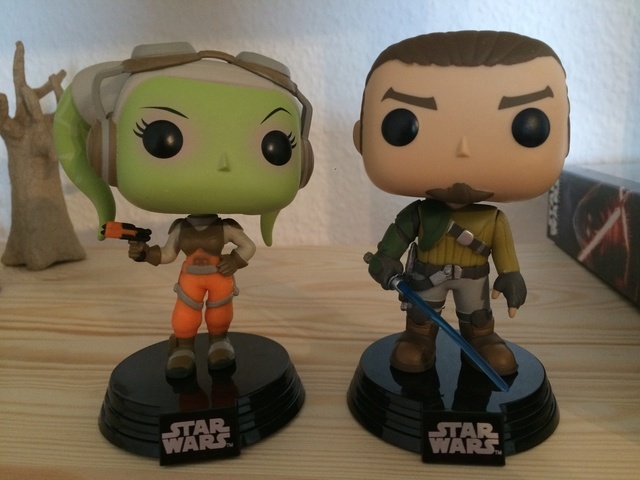 I am not allowed to buy SW merchandizing until the Convention and even then, only if it's something really awesome. Thank you Come on, this is already very good. 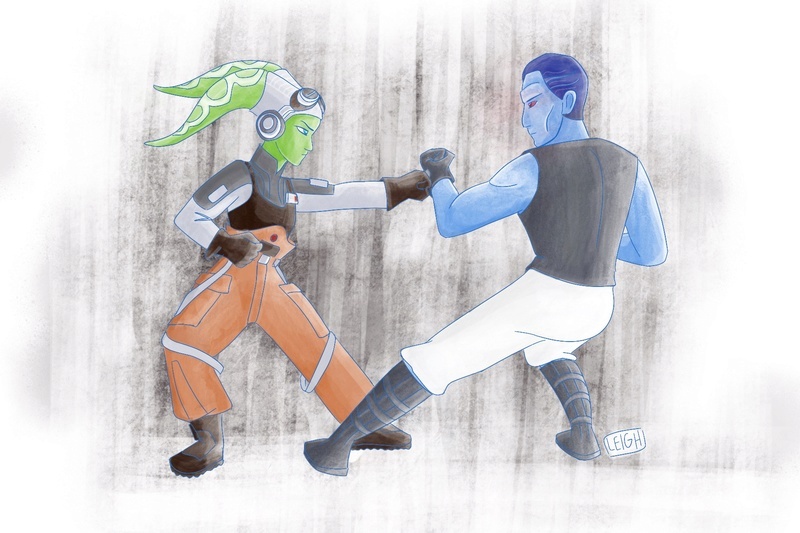 I love how focused Hera looks : "You are going down, Thrawn!". You should send it to Dave Filoni. I think he really likes when fans show appreciation for the show. What are you using? Pencils? I should practise too, but I am more into self-portraits. The type no one wants to see anyway But then I draw for myself. I tried to do smaller and quicker cartoon-like drawings but I think I am just not good at it and I get annoyed very fast too. The only cartoon-like drawings I used to do was Garfield, but that was years ago and I was then drawing greeting cards for family and friends. I tried some time ago to draw Garfield again and realized that I don't remember how to draw him. My cousins and I once did for our grandma's birthday a collection of comic-like drawings of each member of the family. That was quite a lot of work. Each one got 4-5 people to draw with a specific story behind it - I drew for instance one uncle as The Thinker. It was so much fun and was unique - you could really see the 4 different styles. It's kind of sad that nowadays we just buy stuff instead of making stuff. Sorry, I am getting carried away in nostalgia-land. Keep up the good work! And really you should tweet it to Dave Filoni. Just keep practicing. I always wished I had continued with art. I guess it's not too late. @FrolickingFizzgig wrote: I love it, @jakkusun! It's too bad Dave Filoni hasn't been super active on Twitter lately, but maybe I'll still try tweeting it to him. I'm using the procreate app on an iPad mini with a stylus. Self portraits are the best for practicing making your art more accurate I think because looking in the mirror is a convenient reference. I totally agree with you about making your own cards and things--it's way more meaningful. Trailer for the next episode. I really have to admit something here : I don't get the fascination for Mandalorians. I see many fans expressing the wish to see more of them and I am left scratching my head. Maybe it's because I missed some other SW material, but with what I've seen so far, they look to me as a people that loves to fight too much and (blindly?) follows the guy with the sword. Wasn't Revan's partner a Mandalorian? I know, I know, it's not canon. Can someone explain to me what it is I am missing to join the club of Mandalorians fans? @SanghaRen wrote: Trailer for the next episode. I like the Mandalorians...wouldn't say I love them but there is something nice about stories about warrior cultures....I'm taking a guess here but maybe people like them because they're a bunch of non-force sensitives who are some of the best warriors in the galaxy, don't fear force users like the jedi and try to live by a strict code of honor (with some exceptions). They were also a very inclusive culture and allowed any person, irrespective of species or planet, to join their group as long as they followed the Mandalorian way of life....that and the cool costumes probably make them very appealing to some. Revan's partner/apprentice Malek wasn't Mandalorian...both of them defied the jedi council to help the old republic fight the Mandalorians as the republic was being roundly defeated by them. I am bad with names, but I was thinking about Revan's partner in the eponymous book. Somehow I always remember his wife's name Veela, but not his. I just checked and it's Canderous. They're both Mandalorian. I agree, the Mandos are a fun group. They could hold their own against the Sith and Jedi (not canon, I know) and yet had no special powers except for sheer will. They have a very ancient Viking-esque culture that resonates with some people I guess. They even had dragons, once upon a time, called Mythosaurs (see my profile pic). Who doesn't love dragons? Kind of like the Targaryens of the SW universe. Their armor is bad a** too. I read an exchange between a fan and Pablo, the fan had a pretty good theory that Mandos are hiding their force sensitives from the Jedi. 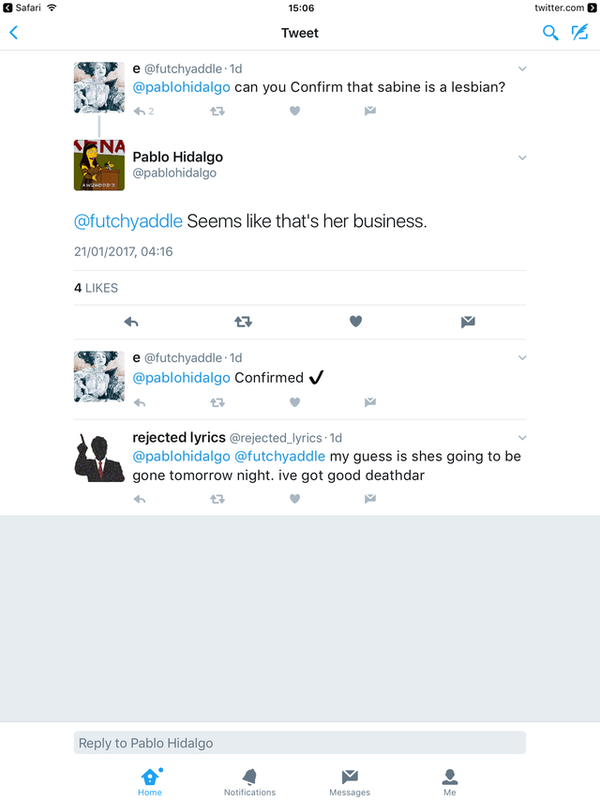 Pablo did not confirm, but I thought it was an interesting thought. They had dragons? Now I am interested. I LOVE dragons. Bring the dragons back in the canon! At the same time, it would become too close to typical fantasy stories so maybe not such a good idea unless they star-wars-ize them. Somehow your profile dragon reminds a little bit of Luke's tauntaun but with bigger teeth. Ooh, that's very interesting! Pabs silence on the issue might be kind of telling too.